The Republic of Fiji Military Forces (RFMF) is the military force of the Pacific island nation of Fiji. With a total manpower of 3,500 active soldiers and 6,000 reservists, it is one of the smallest militaries in the world, though most of its surrounding island nations have no militaries at all. The Ground Force is organised into six infantry and one engineer battalions, with approximately 6,000 reserves. There was formerly one "Zulu" company of counter-revolutionary specialists, which was deactivated in late 2000 due to a mutiny by some of its members. The first two regular battalions of the Fiji Infantry Regiment are traditionally stationed overseas on peacekeeping duties; the 1st Battalion has been posted to Lebanon, Iraq, Syria, and East Timor under the command of the UN, while the 2nd Battalion is stationed in Sinai with the MFO. Peacekeepers income represents an important source of income for Fiji. 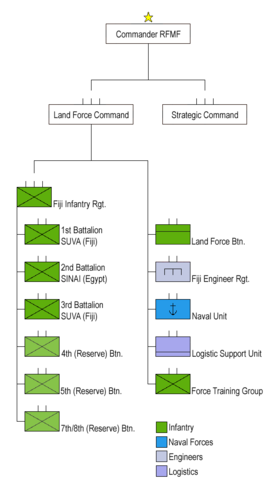 The 3rd Battalion is stationed in the capital, Suva, and the remaining three are spread throughout the islands. Commander-in-Chief – The President of the Republic is ex officio Commander-in-Chief of the Military Forces. Commander RFMF – The Commander RFMF is of two-star rank. He is assisted by the Deputy Commander and the Chief of Staff, who are responsible for Strategic Command and Land Force Command. The current Acting Commander is Rear Admiral Viliame Naupoto following the resignation of Brigadier Mosese Tikoitoga on 2 August 2015. Tikoitoga succeeded the previous Commander and current Head of Government Commodore Voreqe (Frank) Bainimarama after fifteen years of service as Commander and a total of thirty-nine years of active military service. Strategic Command – Strategic Command is responsible for all of the long term and strategic concerns of the RFMF, including welfare, legal issues, sustainability issues etc. The 300-man Navy Unit RFMF celebrated, on 25 July 2015, the fortieth anniversary of its founding. It was formed in 1975 (Naval squadron Royal Fiji Military Forces), following the government's ratification of the United Nations Law of the Sea convention. The Navy is responsible for maritime needs in border control, such as watching over Fiji's exclusive economic zone and organising task and rescue missions. It currently operates 9 patrol boats. Military aid is received from Australia, the People's Republic of China, and the United Kingdom (although the latter has suspended aid as a result of the 2006 military coup against the civilian government). Speaking at 30th anniversary celebrations on 26 July 2006, Commander Bradley Bower said that the greatest challenge facing the navy of a maritime country like Fiji was to maintain sovereignty and the maritime environment, to acquire, restore, and replace equipment, and to train officers to keep pace with changing situations. In January 2019 five of Fiji's naval vessels were operational. In 2020 Australia will provide two new Guardian-class patrol vessels to replace the three vessels it provided over thirty years ago. 3 x Pacific-class patrol boat (Australia, displacement 162 t, length 31.5 metres (103 ft 4 in), width 8.1 metres (26 ft 7 in) draught 1.8 metres (5 ft 11 in), power 2 x 1,050 kilowatts (1,410 shp), maximal speed 20 knots (37 km/h), crew 17-man, armament machine guns 1 x 12.7 mm). These boats replaced discharged Redwing-class minesweepers FNS Kula, Kikau and Kiro, gained 1975 – 1976 from the United States Navy. The Air Wing of the Republic of Fiji Military Forces, founded in 1987, had a base at the airport in Nausori, but was abolished in 1997. Yehonatan Shimʻon Frenḳel writes that the "Air Wing was formed after the 1987 coup, when the French provided two helicopters as part of its military aid package." Frenkel goes on to say that the air wing was disbanded after both helicopters crashed and after subsequent revelations of huge debts incurred as a result of the aircraft. France Transport and liaison helicopter 1989-1994 One helicopter. Matriculation marker DQ-FGD. France Transport and liaison helicopter 1991-1997 One helicopter. Matriculation marker DQ-FGH. Helicopter AS-365 N2 Dauphin crashed off the coast of the main island in July 1994; a smaller AS-355F-2 continued in service until mid-1997 and in 1999 was sold to France. The Air Wing did not have its own roundel or ensign and its only marking was the national flag used as a fin flash. A Boeing 707-339 was reportedly used by the Fiji UN ambassadors, it operated in Pakistan International Airlines markings with Royal Fiji Military Forces titles near the front passenger door. Rank designation based on the British tradition. Fiji's military has a history of political intervention. In 1987, soldiers were responsible for two military coups, and in 2000, the military organised a countercoup to quash George Speight's civilian coup. Since 2000, the military has had a sometimes tense relationship with the Qarase government, and has strongly opposed its plans to establish a Commission with the power to compensate victims and pardon perpetrators of the coup. Among other objections, the military claims that its integrity and discipline would be undermined if soldiers who mutinied in the 2000 upheaval were to be pardoned. On 4 August 2005, Opposition Leader Mahendra Chaudhry called for more Indo-Fijians, who presently comprise less than one percent of the military personnel, to be recruited. (Specifically, as of October 2007, Fiji's military had 3527 full-time members, of whom only 15 were Indo-Fijians.) This would help guarantee political stability, he considered. He also spoke against government plans to downsize the military. Military spokesman Lieutenant Colonel Orisi Rabukawaqa responded the next day by saying that the military was not an ethnic Fijian body, that it stood to serve the entire nation, and that there was no colour bar in its recruitment or promotion. He said that many Indo-Fijians had been reluctant to commit themselves to a military career because of the slow progress of promotion, often preferring to be discharged and to use their record as a stepping stone to a successful career in some other field. Nevertheless, he appreciated the Indo-Fijian contribution to the military, and noted the success of Lieutenant Colonel Mohammed Aziz, the head of the military's legal unit who was a pivotal figure in the court martial of soldiers who mutinied in 2000. Ironically the rate of promotion of indigenous Fijian officers had been very rapid after the 1987 coup, and subsequent expansion of the Republic of Fiji Military Forces. On 26 August 2005, the government announced plans to study ways to reduce the size of the military. Military engineers would be transferred to the Regional Development Ministry, said Home Affair Minister Josefa Vosanibola, and the reduction of the military forces would coincide with an increase in the numbers of the police force. On 26 September 2005, Rabukawaqa revealed that the military had decided to curtail certain operations to stay within its budget. The cuts would affect maritime patrols, search and rescue operations, training and exercises, School Cadet training, and the deployment of military engineers to rural areas. These cuts would be made to ensure that activities accorded a higher priority, such as peacekeeping operations in the Sinai Peninsula and Iraq, officer cadet training with the New Zealand Defence Forces, and the prosecution of soldiers charged with mutiny, would not be affected, Rabukawaqa said. The next day, Lesi Korovavala, chief executive officer of the Ministry of Home Affairs, told the Fiji Village news service that the military had undertaken the reductions on its own initiative, in consultation with the department, an explanation corroborated by Lieutenant Colonel Rabukawaqa. On 5 December 2006, the Fijian army staged a third coup d'état. On 7 February 2008, the head of the RFMF and post-coup interim Prime Minister Voreqe Bainimarama stated: "Qarase [...] does not understand the role of the Military and as such is misinforming the nation. [...] [I]f there are practices and policies which have potential to undermine the national security and territorial integrity of Fiji, the RFMF has every right under the Constitution to intervene." In August 2009, with Bainimarama still controlling the government as prime minister and the constitution abrogated, Ratu Epeli Nailatikau, a former military commander, was appointed acting president on the retirement of Iloilo. The Military of Fiji has always had a close relationship to Fiji's churches, particularly the Methodist Church, to which some two-thirds of indigenous Fijians belong. ^ a b "Commander resigns - Fiji Times Online". www.fijitimes.com. Archived from the original on 1 August 2017. Retrieved 28 October 2017. ^ Vuibau, Tevita (6 March 2014). "By the book". Fiji Times Online. Archived from the original on 7 March 2014. Retrieved 8 March 2014. ^ Vuibau, Tevita (6 March 2014). "Military pays tribute to 'David'". Fiji Times Online. Archived from the original on 7 March 2014. Retrieved 8 March 2014. ^ "Kalouniwai is Fiji's Military Land Force Commander". Islands Business. 6 March 2014. Archived from the original on 7 March 2014. Retrieved 8 March 2014. ^ a b c d e ":: Rosyjska broń dla Fidżi" (in Polish). altair.pl. Archived from the original on 4 March 2016. Retrieved 21 February 2016. ^ "Guns For Fiji - Fiji Sun". fijisun.com.fj. Archived from the original on 13 March 2018. Retrieved 12 March 2018. ^ Ingram-Seal, Leigh. "Republic of Fiji Military Forces" (PDF). Orbat.com. Archived from the original (PDF) on 8 March 2014. Retrieved 8 March 2014. ^ "Next up…Arms Training - Fiji Sun". fijisun.com.fj. Archived from the original on 18 October 2016. Retrieved 12 October 2016. ^ Minister for Defence Marise Payne (9 February 2017). "Bushmaster sale another boost to Fiji-Australia defence partnership" (Press release). Department of Defence. Archived from the original on 28 July 2018. Retrieved 27 July 2018. ^ Vakasukawaqa, Arieta (10 February 2017). "Bushmasters For Our Troops". Fiji Sun. Archived from the original on 28 July 2018. Retrieved 27 July 2018. ^ Maggie Boyle (28 January 2019). "Australian assistance to boost Navy fleet: Captain Tawake". Fiji Broadcasting Corporation. Archived from the original on 30 January 2019. Retrieved 30 January 2019. Meanwhile, there are currently five vessels that oversee the monitoring and surveillance of Fiji’s Exclusive Economic Zone which the Navy is responsible for. ^ Frenḳel, Yehonatan Shimʻon (2007). From Election to Coup in Fiji: The 2006 Campaign and Its Aftermath. ANU E Press. p. 29. ISBN 0731538129. ^ "Military Flags (Fiji)". www.crwflags.com. Archived from the original on 26 March 2016. Retrieved 28 October 2017. ^ "Fiji Rank Insignia – Army Land Forces". The International Encyclopedia of Uniform Insignia. Archived from the original on 29 July 2013. Retrieved 8 March 2014. ^ Appelbaum, Diana Muir (27 August 2012). "How the Sinai Peacekeeping Force Staged a Military Coup in Fiji". Jewish Ideas Daily. Archived from the original on 10 January 2016. Retrieved 8 March 2014. ^ McDonald, Hamish (27 October 2007). "Rumblings of a revolution". Sydney Morning Herald. Archived from the original on 23 July 2009. Retrieved 8 March 2014. ^ "Qarase wrong about military: Bainimarama". Fiji Times. 7 February 2008. Archived from the original on 7 March 2014. Retrieved 8 March 2014. ^ "New Navy Base 'Outside Suva' - Fiji Sun". fijisun.com.fj. Archived from the original on 18 October 2016. Retrieved 12 October 2016. Central Intelligence Agency (6 September 2007). "The World Fact Book – Fiji". Retrieved 20 September 2007.